Hater returns to the pages of this blog. The Swedish indie rock with a nice pop feel holds a firm tempo in the releases. The only way to get the right skills where writing songs and recording them with ever more inventiveness in my book. Live playing is to get tighter and better through playing more often together (and earning money, hopefully, these modern days). Siesta is the third release in circa one and a half year. The good thing is that the quality of this album is not suffering in any way from this pace of release. In fact it seems the band shows a little bit more of its influences on Siesta. When a French "sigh girl" song comes by in the form of 'I Wish I Gave You More Time Because I Love You', the listener is swept back by this bittersweet pop song to circa 1964 and the likes of Françoise Hardy and France Gall. The guitar part would never have been dreamed up at the time, but the rest, the singing, the soft swing, the trumpet are a dead giveaway. What the long titled song shows, is how Hater manoeuvres between an indie and a pop background. Songs get a perfect blend of the two. Over it the trump card of the band in the form of singer Caroline Landahl is laid down, always mixing between a sad or aloof sounding voice. The music complements her mood, but not without adding to it and escaping that mood here and there, giving the music of Hater a much welcome spark, singer Landahl does not possess or shares with her listeners. I will not claim that Landahl is a good singer. For that her voice is too thin and slightly breathy. What I do state is that her voice perfectly fits the format this band chose for itself. Listen to 'Fall Off'. The clear sounding guitars bounce off her voice in perfect ways, supporting it and enhancing the song at the same time. Switching between tight and loose in an instrumental outro, where the band is showing us a view of itself jamming in the practice room, translated into an outro. No solos, no wildness, no noise, just supertight playing with small change for those appreciating them by listening intensely. 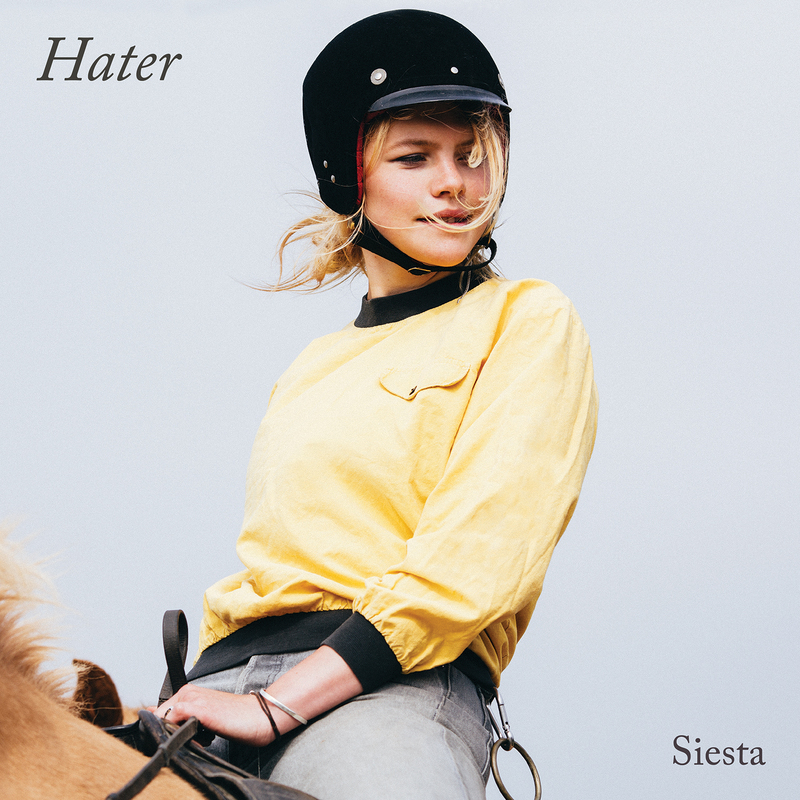 Through the release of an EP, a full album and now a second album, Hater, only starting in 2016, shows promising progress with Siesta. (No such siesta for Hater.) I am certainly interested to learn about the next step.